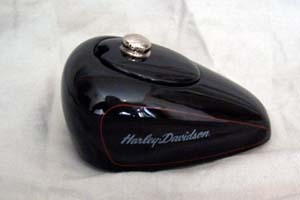 HDG-1: H-D Gas Tank ceramic collectable. Approximately 6" long x 4" wide x 3" tall. 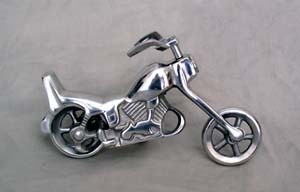 All metal classic handmade motorcycles make geat gifts, mementos or keepsakes. Hand painted artwork with solid metal construction. Each motorcycle sits on its own side stand for display. 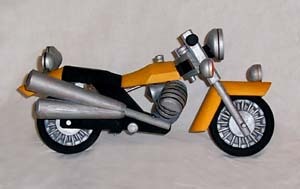 Unique hard-to-find gift ideas for every motorcycle enthusiast. Models come with attached kick-stands. VTCH-01: Billet aluminum Vtwin Chopper. Beautifully sculpted all metal. Length is approx. 10 inches by 6 inches tall. 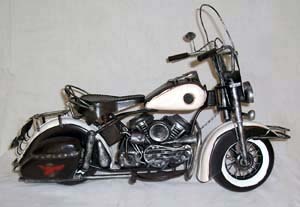 HDDG-01: Harley Davidson, Panhead DuoGlide w/Buddy Seat, length is approx. 18 inches. 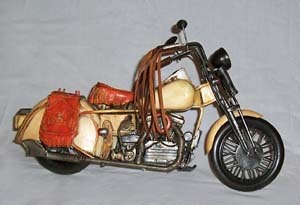 Predecessor to the Electra Glide! 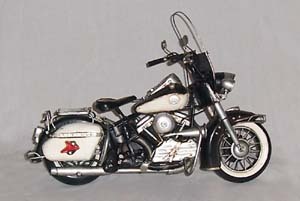 HDDG-02: Harley Davidson, Blockhead DuoGlide, w/Solo Tractor Seat, length is approx. 13 inches. 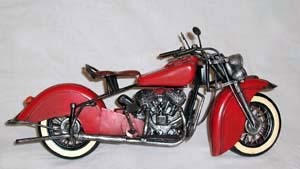 INCH-01: Indian Chief, red, length is approx. 17 inches. 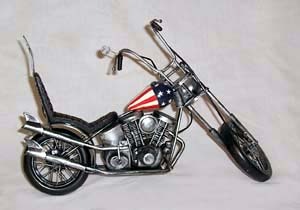 HDCA-01: Harley Davidson, Captain America, Panhead Chopper, length is approx. 15 inches. 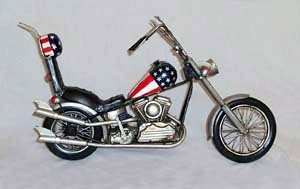 HDCA-02: Harley Davidson, Captain America, Blockhead Chopper w/Helmet, length is approx. 17 inches. 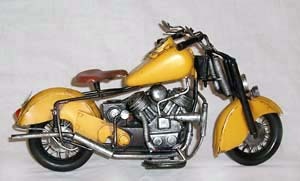 INCH-02: Indian Chief, yellow, length is approx. 16 inches. INCU-01: Custom Indian w/Leather Grip Tassels, length is approx. 16 inches. BMWS-02: BMW Boxer w/Side Car, length is approx. 12 inches. 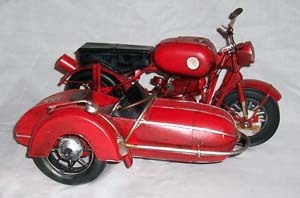 MGVT-01: Vintage Moto Guzzi, length is approx. 12 inches. Note: Hand painted wood. 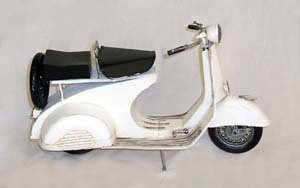 CLSC-01: Classic Scooter, length is approx. 12 inches. TSLS-01: Handlebar Tassles for American style bikes. Dark Brown (pair).